If you write to friends or colleagues in different languages, Yandex.Mail can translate your email to another language or translate emails you receive to English. Yandex.Mail automatically detects the language of each incoming message and suggests a translation when its language differs from the language of the user interface. To translate an incoming message, choose one of the available languages from the list or use the suggested one, and then click Translate. If you want to restore the original text, click Revert. If you have previously translated an incoming message using the built-in translator, Yandex.Mail will offer to translate the reply as well. To translate the reply, click Reply using translator. Click Translate to the right of the formatting toolbar. Select your language from the options and the translation will appear automatically. 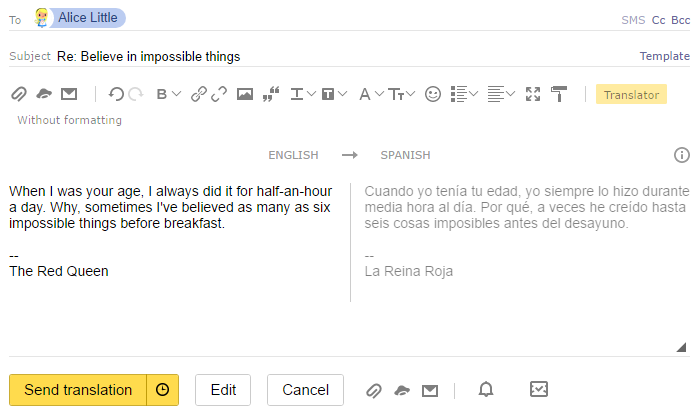 If you want to manually alter the translation, click Edit below the text box. In this case, the email will be replaced with the translation and the original text will no longer be available. To stop translating the email, click Cancel or click the Translate link again. Deselect the offer to translate message option.